The two-time major winning Ulsterman might have been trying to sound modest about his talents but in an interview with “CBS This Morning” to be broadcast today, he refused to write off 36-year old Woods for good. With two major wins in the past 14 months propelling him to the top of the world rankings and with Woods winless in the majors for more than four years, 23-year old McIlroy is rightly regarded as the man most likely to dominate the game over the next decade. Yet he played down the hype in an interview with host Charlie Rose, insisting that the game is in “a transition period” despite the fact that he was the man to break a streak of 16 consecutive first time major winners. McIlroy said: “I definitely think golf is in a transition period at the minute. From the late 90’s until maybe a couple of years ago, Tiger was the dominant player. And he might still be the dominant player in the years to come. The only transition period going on at the moment is the transition of the aura from Woods to McIlroy. While players on both sides of the Atlantic scramble to impress their respective Ryder Cup captains this week, McIlroy and Woods are riding high at the top of the European and US qualifying lists and guaranteed their places in Chicago at the end of next month. Instead, their thoughts will turn to the FedEx Cup race this week and what the golfing world regards as the start of a rivalry that the game badly needs. Paired together for the first two rounds of The Barclays at Bethpage State Park’s feared Black Course on Long Island, it is a chance to see golf’s two heavyweights slug it out on a track that is tailor made for their talents. Woods won the 2002 US Open there by three shots while McIlroy showed his potential as a major contender when he finished 10th before Lucas Glover on his US Open debut. Woods was sixth as defending champion that time and five months later he found his life in tatters when he crashed his car into a fire hydrant and a tree just two days after a National Enquirer had published a story alleging that he had cheated on his wife. Rory McIlroy speaking to “CBS This Morning” host Charlie Rose.The rest, as the say, is history. And so is Woods the major winner for the time being at least. He hasn’t won a major since that 2088 US Open win at Torrey Pines and McIlroy has emerged as the biggest threat to his bid to win the five majors he still needs to break Jack Nicklaus’ record of 18 major wins. 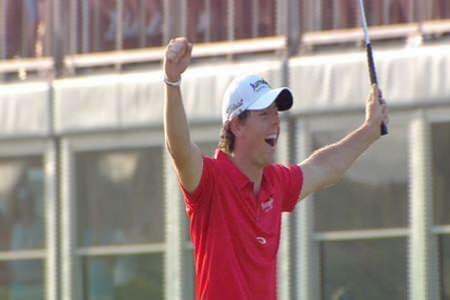 McIlroy is now regarded as the favourite to win the vote for the PGA Tour Player of the Year award. But he is also on track to win the PGA of America’s Player of the Year and that organisation’s Vardon Trophy Race. McIlroy earned 40 victory points for his victories in the Honda Classic and PGA Championship, and is second behind Woods in season earnings and adjusted scoring – each worth 18 points. Woods has 70 total points, based upon 30 points for winning the Arnold Palmer Invitational, the Memorial Tournament and the AT&T National, and 20 points each for leading the season money list and the season scoring average. “However, Woods is ineligible for the Vardon Trophy after withdrawing in the final round of the WGC-Cadillac Championship on March 11. The incomplete round resulted in a .10 penalty to his adjusted scoring average, (from 68.91 to 69.01), moving McIlroy to the top of the Vardon standings. “Woods’ adjusted average after the penalty, however, allowed him to retain the lead in the scoring column for the PGA Player of the Year Award. Interestingly, Padraig Harrington is seventh in the Vardon Trophy standings, which is a testament to his consistency in the majors this year. And had he performed better on the greens and won an event this year, he might not be relying on a wildcard that would extend his Ryder Cup run to seven in a row. The Dubliner may have to win to convince Jose Maria Olazábal that he is worthy of a second consecutive Ryder Cup wildcard. However, former skipper Colin Montgomerie appeared to hint yesterday that Harrington’s experience might be worth having in an away match. Monty said: “A team with no rookies in America is a stronger one, I feel. It’s difficult, there is no question. Q: Augusta has announced that it has offered an invitation to two female members. It’s a good thing. 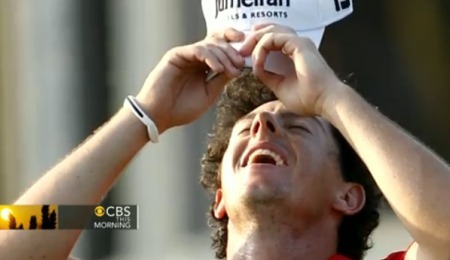 Rory: “It’s a great thing. It’s a great thing for golf, it’s a great thing for Augusta. I think it is something they should have done a while ago. But it’s great to see. And it’s great to see they are moving with the times. Things move forward and they are adapting to that. It will be great to see some female member at Augusta. Q: .. I assume they wanted to do it on their own time? Rory: For sure. And I think people have to respect that as well. It is a club full of such tradition and such history and I am sure making a decision like that, from the outside it might see easy but from the inside I’m sure it was a lot more complicated. Tiger Woods tried a new tactic at the US PGA. Trying to enjoy himself turned out to be not so much fun. Photo Eoin Clarke/www.golffile.ieTiger Woods tried to find his happy place at the US PGA and walked away with a frown. But when Rory McIlroy remembered to play golf like a kid and smile, he walked away with another record eight-shot win and a second major title. Boom. Rory McIlroy eagles the last in Singapore for a 65 that helped him clinch the European Tour’s Race to Dubai two weeks ahead of schedule.Newly-minuted European No 1 Rory McIlroy has been named as winner of the PGA of America Player of the Year award and Vardon Trophy. But they are just the first of many gongs the 23-year old will pick up over the next few weeks as he puts the final brushstrokes to the best season of his career. Rory McIlroy: "If in 2013 I don’t win a major I'll be disappointed"
Rory McIlroy birdies the 18th to win the 2012 US PGA by eight shots. Picture courtesy RTERory McIlroy insists he will be “disappointed” if he doesn’t win another major in 2013 and hopes he can continue “living the dream” by battling idol Tiger Woods down the stretch as he tries to complete the career grand slam by winning the Masters and the Open.